Wanting to get more of a younger demographic back involved with the hobby is something I think all manufacturers would like to do. This hobby started out for kids. Then it became a business when all of that old cardboard started to gain value. Follow that up with much more attention focused on autographs/memorabilia. Newer products can financially be out of the range for some would be collectors. Some say digital products like Topps Bunt could possibly be the answer. Physical products with digital tie-ins maybe. I don’t know because I’m not a fortune teller. Its tricky trying to create a product for a younger audience. Kids don’t like being treated like kids. They want to pull out the big stuff they see others getting. But at the same time the manufacturer has to be careful not to load it up too much or the price per box/pack ends up being too high. Its a balancing act. For years I’ve said that Topps should have a corporate booth on the Little League campus during the World Series like many companies do. Talk about hitting your target audience. Little League has been known to be picky and expensive about who can and cannot setup. There is a whole system to it. Enter 2018 Topps Big League Baseball. Hobby boxes come with (24) packs, (10) cards per pack, and cost about $45. Its possible to pull a hit, but there is nothing guaranteed per box. The base set consists of (400) cards. Parallels include Gold (one per pack), Blue (Blasters), Rainbow Foil #’ed/100, Black & White #’ed/50, and Red Foil #’ed 1/1. Photo variations are in here too. The easiest ones to pull are the Base Player Weekend Nickname variations. These fall 1:3 packs. I actually consider them more of an insert. More difficult variations come 1:507 packs. Like I mentioned before, you aren’t guaranteed any hits per box. With that being said, autographs can be pulled. There are two types of autographs. The first is Big League Autographs which come 1:114 packs. (34) current stars and veterans make up this checklist. The other is Rookie Republic Autographs coming in at 1:102 packs. (23) rookies are in here. All autographs have Gold #’ed/99, Black & White #’ed/50, and Red Foil #’ed 1/1 parallels. Star Caricature Reproductions and their original artwork counterparts make for fun pulls. These add a bit more animation to the player’s face. I’d have to say that my favorite cards are the Ballpark Landmarks portion of the base set. You’ll find that they fall between card #351 and #365. A card of the Harry Kalas statue at Citizens Bank Park would have been neat to see. The one of B&O Warehouse reminds me of the two times the National Sports Collectors Convention was held in Baltimore. I can almost see the restaurant I ate at. If you’re a set collector who wants a break from this year’s flagship design, 2018 Topps Big League Baseball might just work. Due to a decline in donations and an increasing amount of debt, the Big 33 Scholarship Foundation has decided to close it’s doors after sixty years. For now, the annual football game it use to sponsor will be under the supervision of the Pennsylvania State Football Coaches Association. The Big 33 Football Classic began in 1957. Its often been referred to as the Super Bowl of High School Football. Over the last six decades the best high school players from Pennsylvania have taken on Ohio, Maryland, and Texas. In the early years Pennsylvania would just play itself splitting up between east and west or blue and gray. Between 1957 and 1960 Pennsylvania played against collected talent from around the nation. Lots of famous football stars have played in the Big 33 game – Herb Adderley, Joe Montana, Dan Marino, and Jim Kelly. Those are just a few. Starting in 1991, they began to make team sets. The Pennsylvania set contains (36) black and white cards. Key cards include Ray Zellars, Curtis Martin, and Marvin Harrison. All of these predate their NFL rookies. It’s 1991 Maryland counterpart doesn’t really have any major cards worth talking about. Any Big 33 card can make an interesting addition to your collection. For some collectors, these can be the Holy Grail. Later on, some sets included autographs. 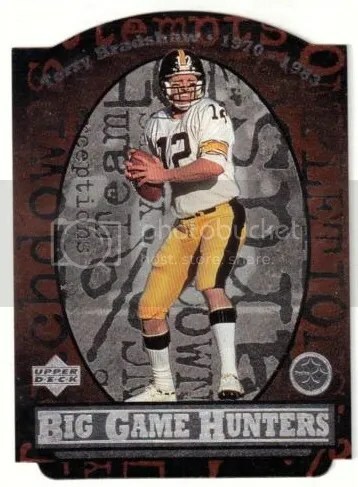 Its too bad they didn’t make Big 33 cards in the beginning. 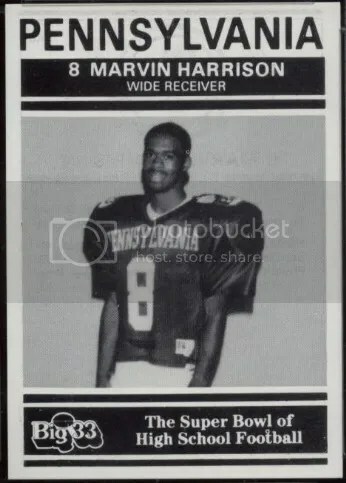 As of right now, only three Hall of Famers have Big 33 cards – Marvin Harrison, Curtis Martin, and Orlando Pace. During my senior year in high school, I received a Big 33 Academic Scholarship. That included a trip to the 2004 Big 33 game in Hershey, PA. A couple of players from that game made it to the NFL – Chad Henne, Brian Hoyer, Darrelle Revis, and Ted Ginn Jr.
At one time the Big 33 Football Classic was a large attraction. According to some past players, the talent just isn’t participating anymore. Guys don’t want to get hurt and/or they’ve already committed to playing for a college. 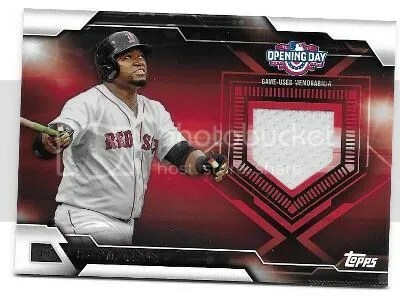 Congrats to Greg on being the lucky winner of the David Ortiz 2016 Topps Opening Day Jersey. Once Greg sends me his mailing address, I will ship this card ASAP. Thanks!